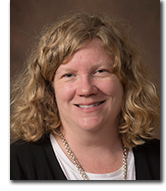 Dr. Sheumaker teaches courses in public history, American Studies, and history and memory. Her students are often in the archives and creating online exhibits for local history groups. Sheumaker's work focuses on issues of consumerism in nineteenth-century and early twentieth-century United States. She is the author of Love Entwined: The Curious History of Human Hairwork (University of Pennsylvania Press) and is co-editor of American Material Culture: An Encyclopedia (ABC-CLIO), has authored several articles on material culture and narratives of collecting as well as essays related to pedagogy and classroom techniques. She is currently working on a book about 50 artifacts of daily life in 20th century United States, under contract with Greenwood Press. The recipient of grants from the Institute of Museums and Libraries, local associations, and other organizations, she is a former Curator of Education at the McGuffey Museum at Miami.